Looking for a healthier Christmas treat to add to your holiday party? These Strawberry Santas make being healthy much more fun. All you need are strawberries, mascarpone cheese and a little powdered sugar and gel icing. 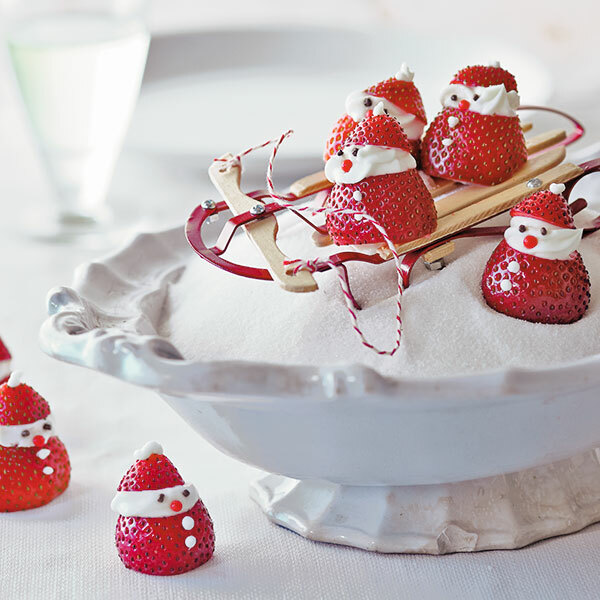 You'll find these Strawberry Santas are almost too cute to eat! Using an electric mixer, beat mascarpone cheese with powdered sugar until smooth, about 3 minutes. Transfer mixture to a pastry bag fit with a decorating tip (a small one with 5 points). Set aside. Cut greens tops from strawberries to create a flat base. Cut top ¼ inch from strawberry to make a Santa hat. Pipe a small swirl of the mascarpone cheese mixture onto cut small end to make a face. Top with the strawberry Santa hat piece. Finish with small dots of frosting for buttons, eyes and nose.